Children ages 6 to 10 may come to the Valentine’s Story and Craft hour on February 5th from10am to 11am. Enjoy doing a craft, playing games and listening to a story. Pre-registration is required and space is limited to the first 30 children. Stop in or call the library to register. Interested in giving the gift of life? The library is hosting a blood drive and we’d like to invite you to join us and donate life-saving blood on Saturday, February 12th from 11am to 3pm.Please call 1-800-REDCROSS to get a donation appointment. February is National Heart Health Month, and in recognition, the library will be hosting the annual Heart Health Event on Friday, February25th. Make sure to stop in anytime between 10am and 3pm for free blood pressure screenings,$2 cholesterol tests (non-fasting), exercise and nutrition demos, heart healthy goodies, giveaways and more! Medical services provided by Mercer Health and Grand Lake Health. Tuesday of the month at 7:00pm. Please preregister by calling 419-586-4442 or emailing Connie Gray at smithco@oplin.org. The meeting is Tuesday, February 15th. 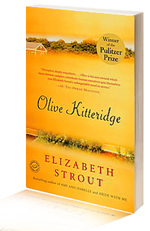 The book is 2009 Pulitzer Prize winning Olive Kitteridge by Elizabeth Strout. The tale of an aging schoolteacher too obsessed with the deterioration of her little town of Crosby, Maine, to realize the problems plaguing her own life. Olive Kitteridge offers profound insights into the human condition-its conflicts, its tragedies and joys, and the endurance it requires. Don’t miss out, call today to pre-register!